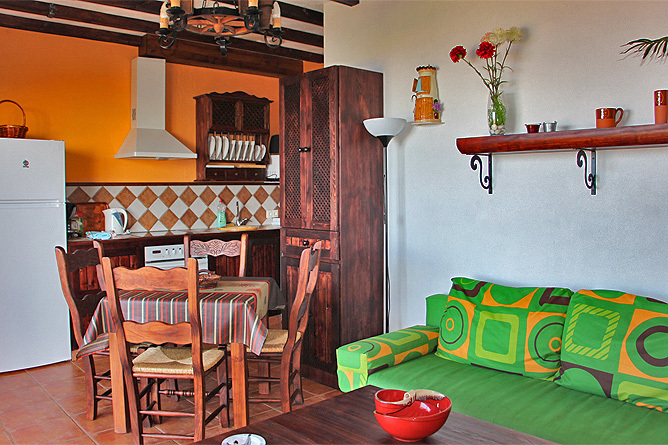 The building with a total of 6 equivalent Holiday Apartments is nestled on a 3200m² property. 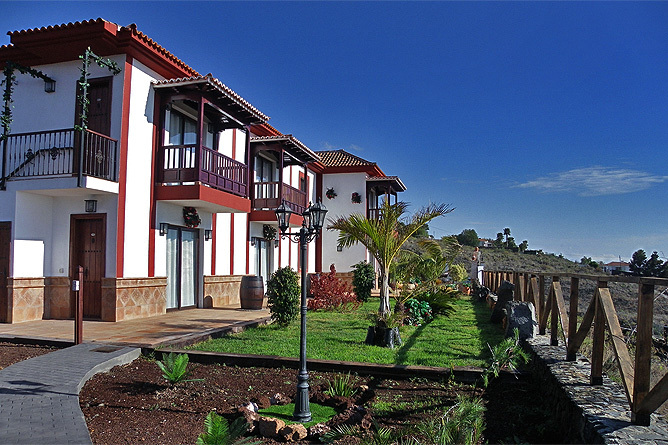 The three upstairs apartments each have a balcony and those on the ground floor feature a terrace. A shared heated pool and a Jacuzzi are part of the well maintained outdoor area featuring also a spacious shared grill area. 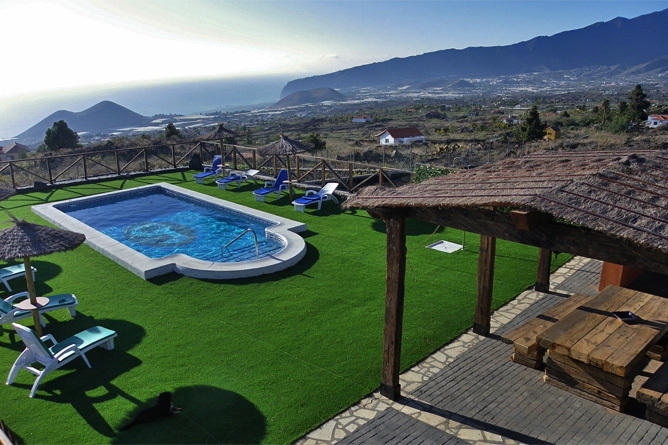 You enjoy a panoramic view of the National Park Cumbre Vieja, the Pico Birigoyom a well known hiking area and in the backdrop is formed by the Aridane Valley and the sea. Comfortable loungers are available at the shared pool area with a heatable pool and sun umbrellas that provide you with shade. 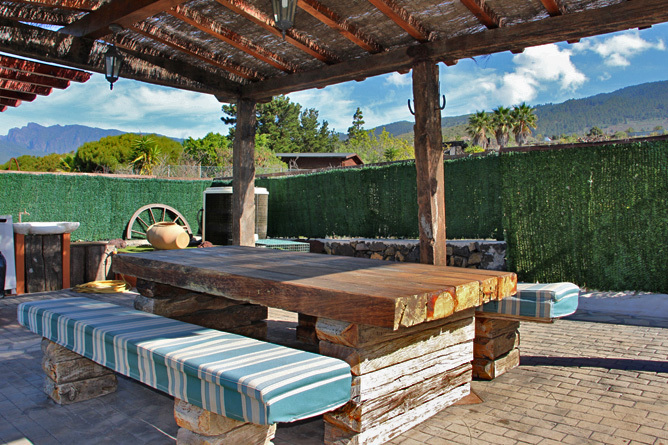 As spacious, roofed grill area with a large table and two benches for pleasant gatherings as well as a separate toilet are available for all guests. 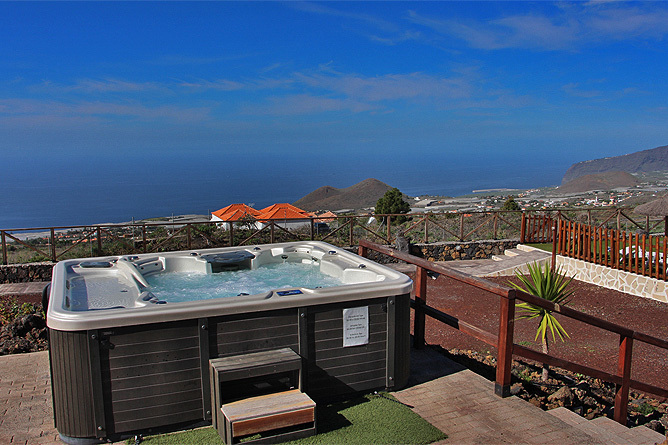 The Jacuzzi is located on a slightly heightened, small natural stone and lava hill. 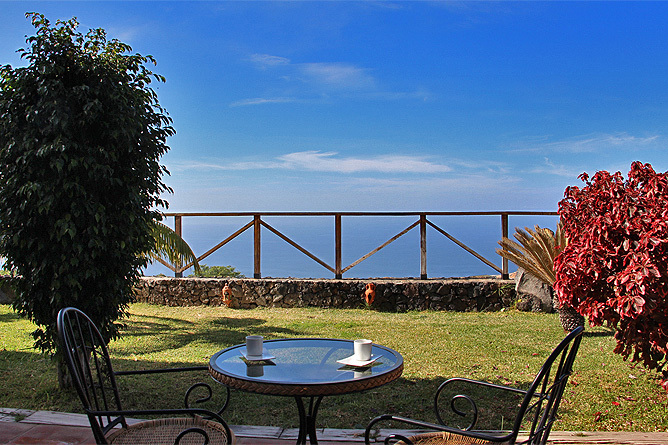 Due to this elevated position you enjoy a beautiful open view of the surrounding landscape and the ocean. 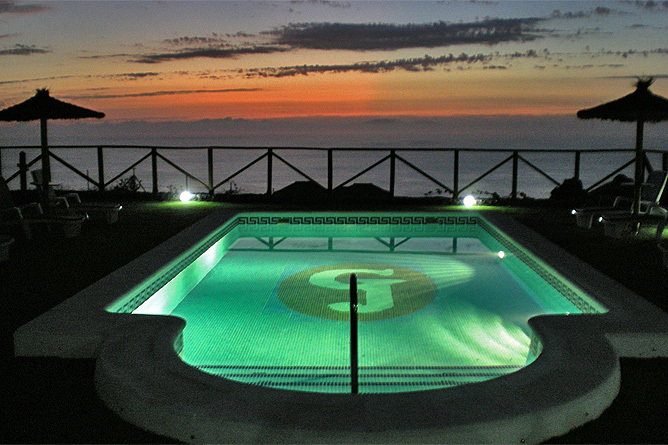 At night the illuminated pool and Jacuzzi create a romantic ambience. 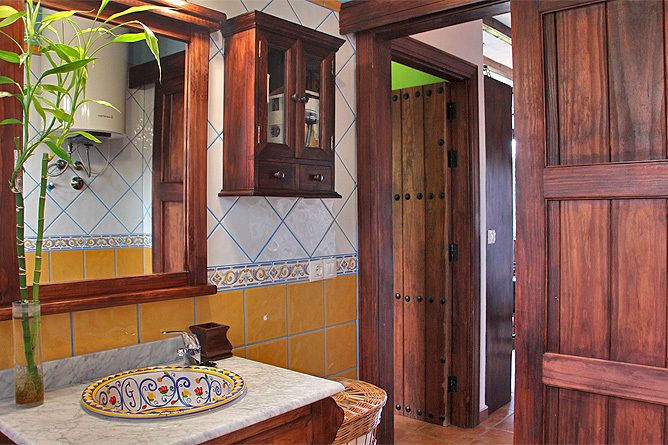 A small wooden bridge leads to the house which is surrounded by a lovely arranged garden. Old wooden wine barrels make a nice decoration. 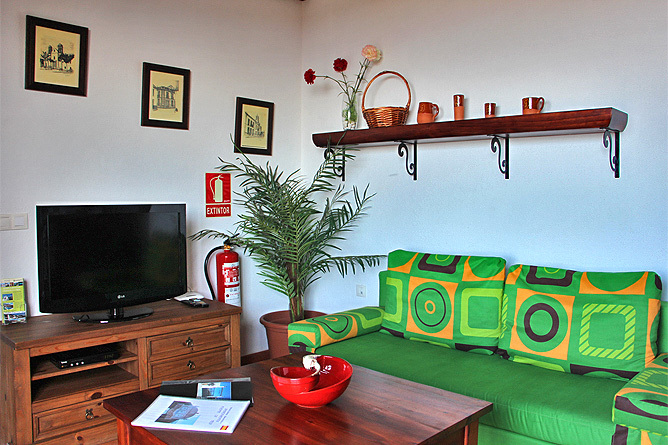 All Holiday Apartments are well appointed with a modern touch. 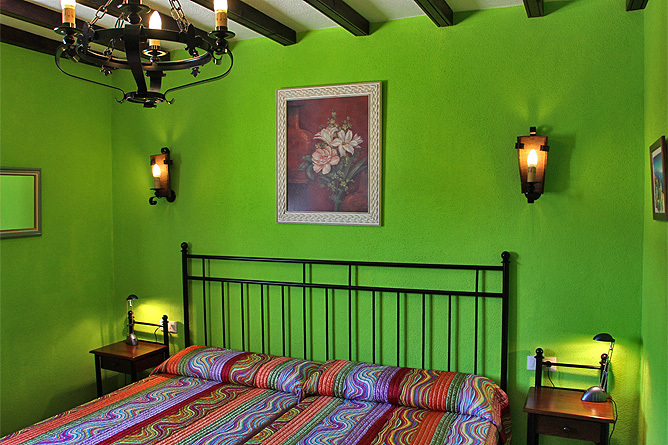 Beautiful wooden furniture were combined with colourful accents on the wall and other decoratios. 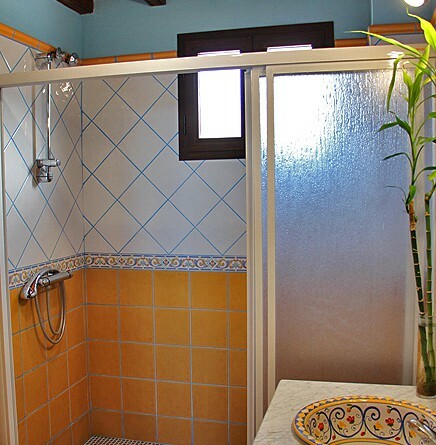 The 45m2 Holiday Apartments each have 1 bedroom with a double bed or two single beds, a bathroom with a shower and a toilet as well as a spacious combined living-dining area with a sofa bed and a kitchenette. 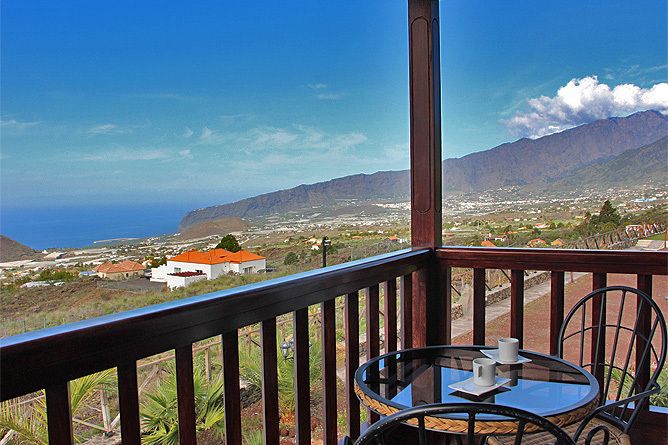 Additionally, each apartment features its private terrace or balcony furnished with a table and two chairs. 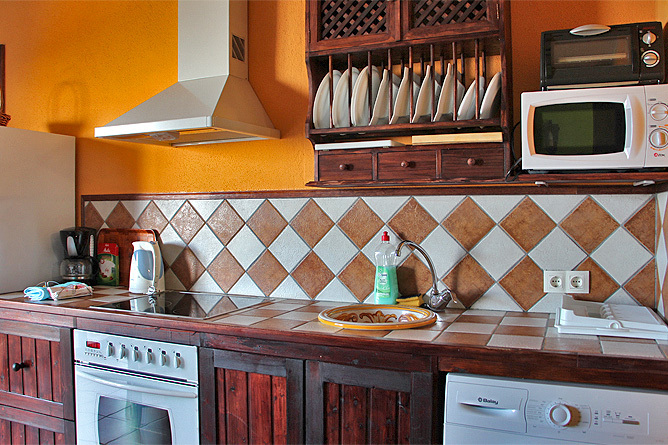 The images are examples of the identically equipped Holiday Apartments. 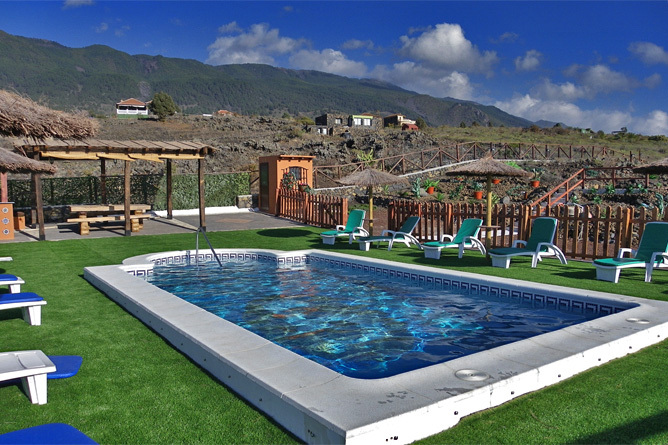 The Holiday Apartments Fuente la Teja are located in Las Manchas de Abajo, near the lava flow of the Volcano San Juan. Further to the south the lava landscape is shaped by the volcanic eruptions of the San Juan Volcano in 1949 and 1971. 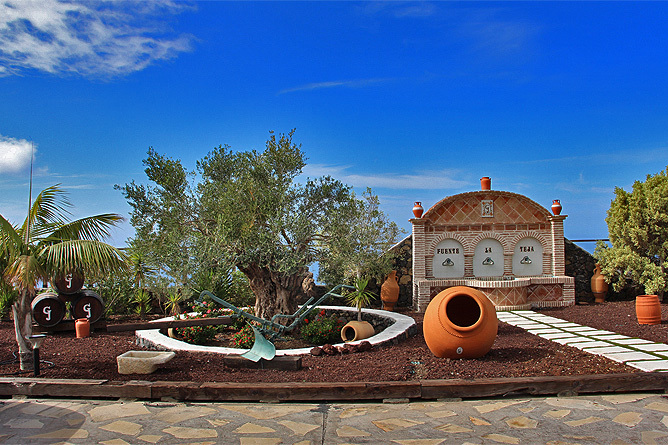 A culinary highlight in the surrounding area Bodegon Tamanca. 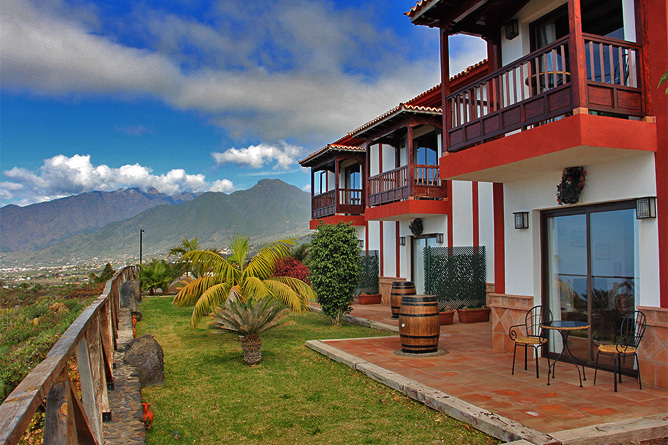 It is an extraordinary, quaint restaurant in a Bodega on the mountain. Not far from there you find also the Secadero, a good grill restaurant. 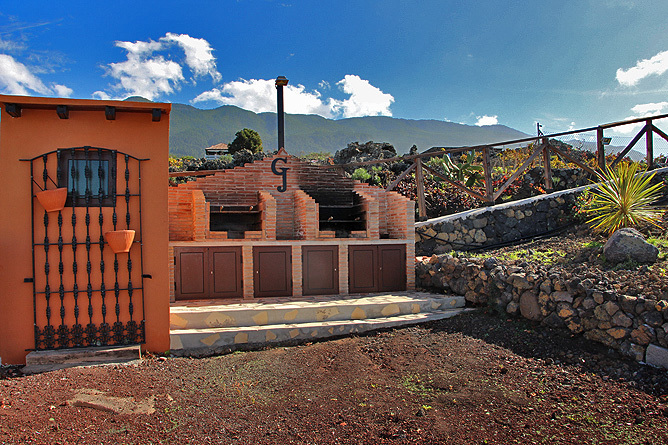 In the neighbour village Jedey you find the good Pizza Restaurant Evangelina and a small grocery store. More shopping facilities are found in Todoque. A nice place to visit is the artistically designed Plaza Glorieta in Las Manchas de Abajo. 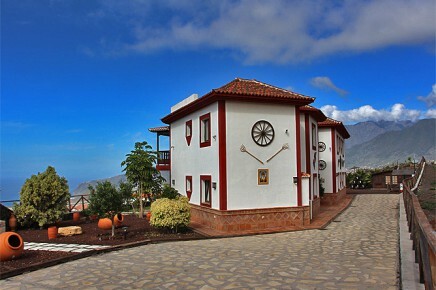 Nearby there is also the wine museum, where you can taste and buy all wines from the Canary Island of La Palma. 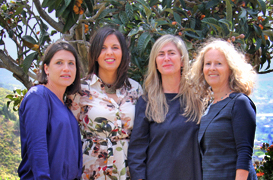 El Paso and Los Llanos, the two larger towns, are located within 10-15 driving minutes and offer lots of shopping facilities. The beautiful Plaza in Los Llanos invites you to linger and the town is great to stroll along the lanes. Both towns offer many, small restaurants. 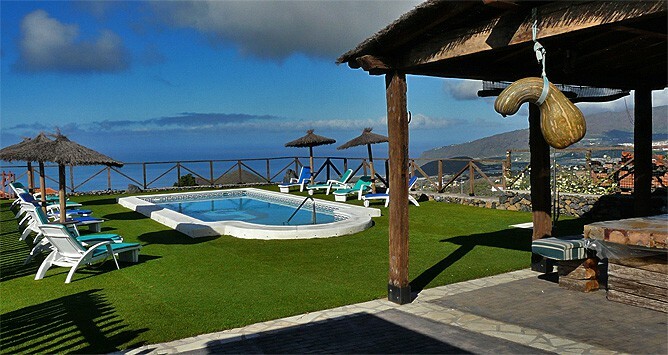 The palm-fringed sandy beach of Puerto Naos is within 10-15 driving minutes and the sandy beach of Puerto de Tazacorte is located within 15-20 minutes. 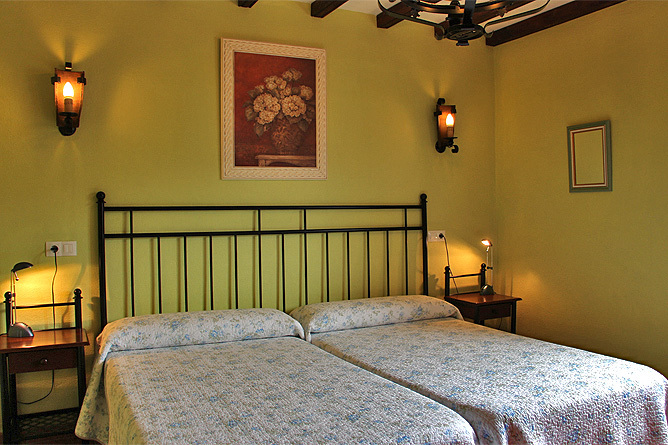 Apartamentos Fuente la Teja is a perfect place for families, nature lovers and hiking enthusiasts as well as guests who appreciate a neat ambience. 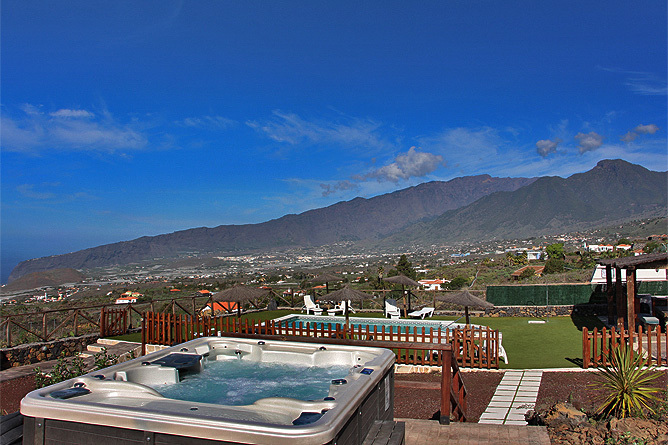 Well-kept Holiday Complex with 6 Apartments, heated pool and Jacuzzi.